drg. HM Bernard Iskandar, SpKG (K) : "My First Endodontic Case"
drg. Ifwandi, Sp. Pros : "The Power of Diagnostic Wax Up"
drg. Rinto Abimanyu, Sp. KG : "Whitening Teeth as A Simple Choice to Brighten Smile"
drg. Rudy Wijayanto, MDSc, Sp. 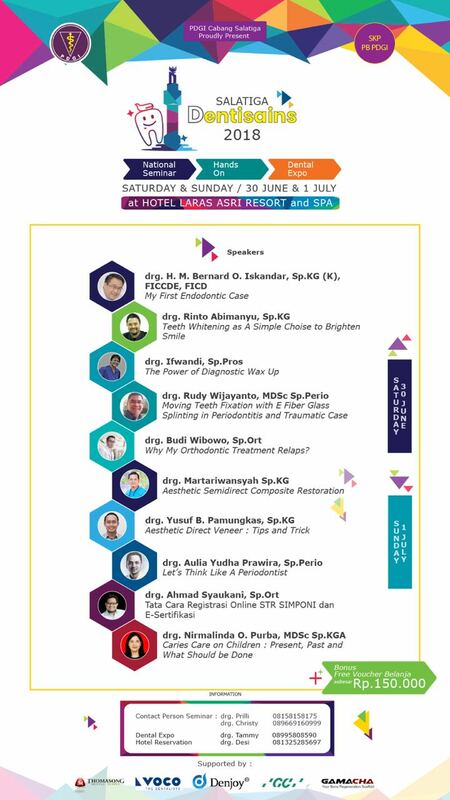 Perio : "Moving Teeth Fixation with E-Fiber Glass Splinting in Periodontitis and Traumatic Case"
drg. Budi Wibowo, Sp. Ort : "Why My Orthodontic Treatment Relaps?" drg. Martariwansyah, Sp. KG : "Esthetic Semidirect Composite Restoration"
drg. Yusuf B. Pamungkas, Sp. KG : "Aesthetic Direct Veneer: Tips and Tricks"
drg. Aulia Yudha Prawira, Sp. Perio : "Let's Think Like A Periodontist"
drg. Ahmad Syaukani, Sp. Ort : "Tata Cara Registrasi Online STR SIMPONI dan e-Sertifikasi"
drg. Nirmalinda O. Purba, MDSc, Sp. KGA : "Caries Care on Children: Past, Present, and What Should be Done"
"Mock up and Temporary Restoration Crown/Bridge"
"Whitening Teeth as a Simple Choice to Brighten Smile"
in Periodontitis and Traumatic Case"
"Creating Natural Direct Veneer Composite with 2 Layer Composite"